Created specifically as a replacement for the '03-'04 Ford Mustang Mach 1 "Shaker" Hood graphic, this two (2) piece kit installs easily. Featuring a 9/32" (7.143mm) pinstripe at the outer edge as shown, pieces are PRECUT and ready to install in a wide variety of colors - NO TRIMMING required! This stripe package is not just a straight strip in a box. Our graphic kit consists of prefitted and contoured pieces as shown in the illustration. 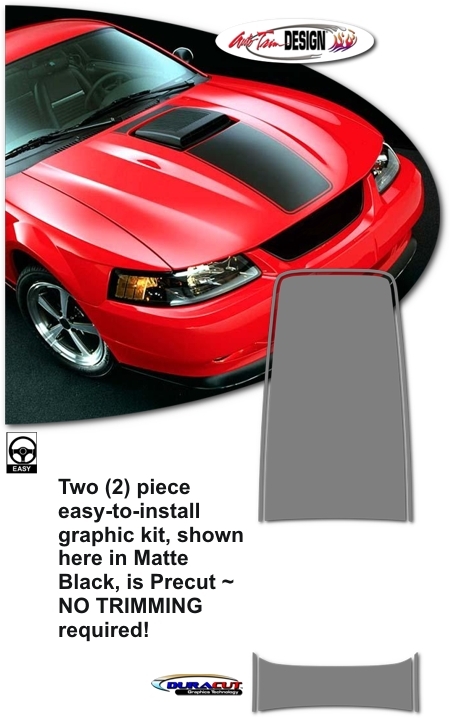 Kit is specifically made for '03-'04 Ford Mustang Mach 1 factory hood with "Shaker" scoop cut-out and will not fit any other vehicle.